UPDF soldiers find a watering hole, Northern Democratic Republic of Congo (DRC). In 1986, Yoweri Museveni seized power in Uganda but had to crush a vast popular rebellion movement among the Acholi ethnic group in the north. Survivors regrouped under the leadership of Joseph Kony to form the Lord's Resistance Army (LRA), which launched a pitiless guerilla war, soon famous for its massacres and mass kidnappings of adolescents for forced recruitment. In reply, the Uganda People's Defense Forces (UPDF) emptied out the countryside and concentrated the Acholi population in unsanitary camps that soon turned into death traps, claiming ten times as many victims, according to data provided by the World Health Organization, as the LRA itself. In 2005-06, the LRA was finally driven out of Uganda and its main bases in South Sudan and withdrew to Eastern DRC. Two years of peace negotiations finally ended with an agreement, but Kony refused to sign. In late December 2008, Uganda launched a botched offensive, and the LRA scattered across Congo, South Sudan, and the Central African Republic, perpetrating numerous atrocities against the local population. The UPDF are still pursuing them throughout the three countries. This piece was originally published by Le Monde Magazine on August 6, 2011. The Mi-8 buzzes above the trees, a fat bloated insect with swollen flanks, white as a mythical whale that has suddenly taken to the skies. Its shadow flits lightly over the green treetops. A few ports are open, and a cheerful wind sweeps through the hull; the cockpit door, unlatched, flaps open, revealing the thick reddened necks of the Ukrainian pilots. The helicopter is rented, using American funds, by the Ugandan military: UPDF, Uganda People's Defense Forces. Two officers sit on a bench, AKs between their knees, unloaded and barrel down. An Air Wing lieutenant, his ear glued to a handset in spite of the racket, guides the flight. In front of him are stacked cases of corned beef, millet flour, and bottled water. Through the port in the cabin door one can look down on the forest, a vast ocean of ever-changing green hues, shot through with pale, winding, treeless streaks. In the distance, a grey mass weighs down on the trees, a cylinder of misty rain joining cloud to greenery. The chopper is somewhere between South Sudan and Congo, nothing indicates the border, there is no sign of life, not a fire, not a field, not a hut. This is where the enemy hides, and one only has to look to see the impossibility of these endless search missions. What the Ugandans call OLT, "Operation Lightning Thunder," covers an area as large as Germany, entirely forested, sparsely inhabited, almost devoid of roads. The enemy in question is the Lord's Resistance Army, Ugandan rebels driven over the border years ago, who nonetheless continue to kill, loot, and kidnap young slaves throughout three neighboring countries. There must be a few hundred of them left. Go find them down there. The bush. Northern DRC, May 2011. The bush, the Ugandans call it. Twenty minutes after landing, at the edge of a forlorn village called Nakale, a small column of UPDF soldiers, together with their visitors, reaches the edge of the forest and passes between the trees. Suddenly the pace changes, slows down, stumbles. You weave between small, stocky palm trees draped with vines, get entangled in brambles; broken branches, covered with thorns, catch your feet; the rhythm is irregular, difficult. Sun dapples the branches, makes some leaves glisten, caresses others, leaving still others in shadow; spiderwebs shine in sun shafts, tree trunks rise like grey columns in the midst of the greenery. You can barely lift your head to look, you have to keep your eyes to the ground, the weeds hide nasty surprises; leave your foot in the wrong place for an instant and suddenly red ants swarm under your pants, driving their mandibles into your skin and surging up toward your hips, the column keeps moving and you can't stop, you have to pick them off one by one, while you're walking. The only sounds are the heavy clump of footsteps, the brush of bodies against branches and leaves, your own breath: speaking is forbidden, voices carry far in the forest and the enemy could hear. There is no path, the GPS dictates the direction, a man up front hacks away at the main obstacles with a machete, the ones behind him make do as best they can with whatever is left. The terrain varies; you emerge from the woods into a plain of half-dry tall grass scattered with little trees, the pace picks up amid birdsong and screeching insects. 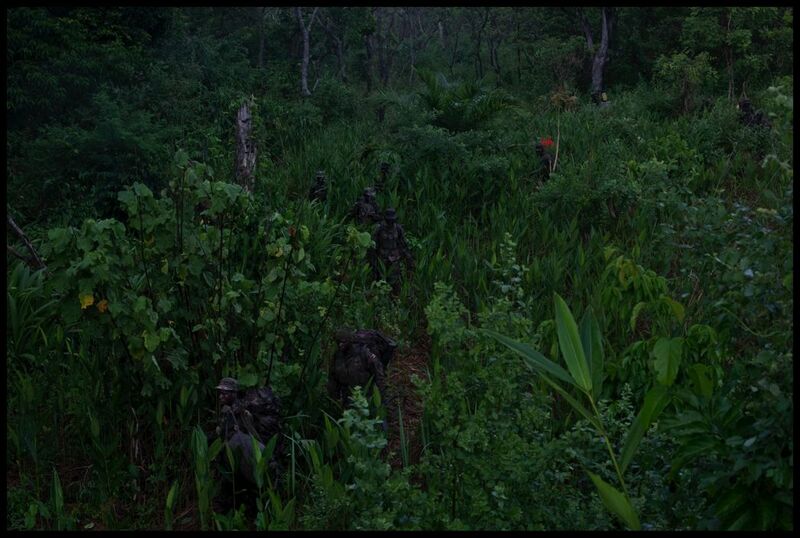 Then another thick forest starts up, where again you struggle forward at the rhythm of machete chops. In the middle of a palm grove, a swarm of bees attacks the men, someone must have disturbed their nest, they cling to heads and eyelids to sting, the venom burns, you dive through thorn bushes to escape them as they chase the routed column, dying one after the other to drive it as far away as possible from the hive. Afterward come great marshes, congested with grass taller than men and reeds that have to be flattened before you can walk on them, your feet slip, you skid, fall, it's even harder than the forest. Sweat flows freely, soaks through the clothing, but the soldiers don't drink much, water is rationed, two liters a day usually, sometimes just one; the LRA, they say, can go for an entire day without drinking, torture in these conditions. Water is a major stake here, the bush is dry despite its luxuriant growth, and the watering holes determine one's movements and choice of camp. You cross a dried-out river with a few muddy puddles left, a soldier fills his bottle; a metal plate is found, traces of net fishing: the enemy passed by here, about a week ago. A little farther on you come across their camp, a "defense" as the UPDF say. A few fires, some beds made from dry grass, with ditches to channel the rain and sticks at the four corners to support the poncho that serves as a tent. "This is not how UPDF camps," explains Captain Patrick Mukundane, who commands the section. The GPS coordinates are taken and sent on to Nakale, the beds are counted to estimate the size of the enemy group, a soldier runs his fingers through the ashes, their texture allows you to guess the age of the camp, one to two weeks, apparently. On one of the beds still lies the information leaflet from an antimalarial medication: the LRA sometimes have medicine, taken from the traders who travel the region's roads on bicycle. "A big commander was living here," says Patrick. "We know from the way they were organized. They were fishing, digging for wild yams. There are so many tracks around here, they probably stayed like a month here. It could be Ongwen. He likes fish a lot." 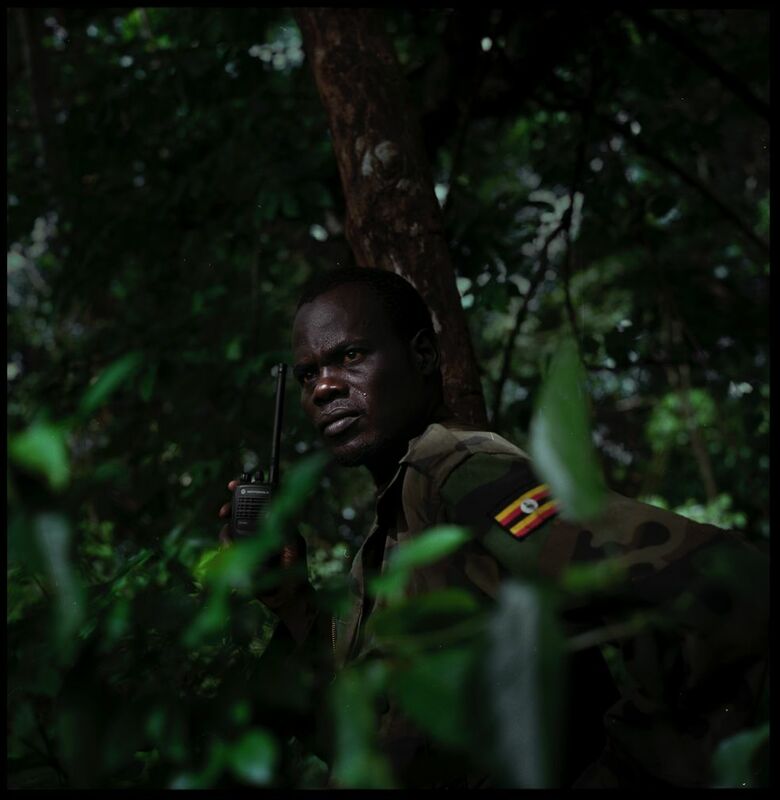 Dominic Ongwen is one of the three LRA commanders wanted by the International Criminal Court (ICC), a killer responsible for horrendous massacres: he's known to be in the area. Several times, the UPDF almost cornered him, they freed his wives—young girls kidnapped and forced to marry him—took some weapons from him, but he's a sly one, he always managed to slip away. When the soldiers finish their searches the march starts up again. Further on there are foot tracks. The LRA again? The section will come back tomorrow to follow them, with more men. Around 4:00 p.m., you're only—according to the GPS—400 meters from your goal, another LRA defense where the UPDF squad that the column is coming to reinforce is waiting. These 400 meters, as the crow flies, must actually be more like a kilometer on the ground, just as the 8 kilometers already traveled must be more like 12 or 13. You burrow into a dense, impossible forest, you don't make any progress, your feet keep twisting on creepers and roots, every five minutes the captain sits down on a box of ammunition while his men clear the way. It's dizzyingly beautiful, but during the pauses you have time to think through the gap between this visual splendor and the psychic oppression of the bush. You can see it in the pictures: while the amateur will take pride in producing images of gleaming green, bursting with light, the true photographer will create dark images, where the rare gleams of light barely let you glimpse a human figure, struggling through a universe essentially hostile to him. Yet people live here, Zande peasants—the ethnic group that occupies the region where the LRA is now rampant—had their homes in the bush, in small family groups, before being chased away by the arrival of the rebels fleeing the failed December 2008 Ugandan offensive. "Where there were the palm trees, there used to be a settlement," Patrick explains. "Maybe two-three years ago, not so long, the bush grows back fast if you don't take care of it." The LRA also live in the bush, for years, hunted like wild animals who can only attack weaker ones. It's hard to see how they last. For the UPDF, the conditions are harsh, but they are backed by a whole logistics, they have GPS, radios, boots, and new ponchos, every seven days the Mi-8s based in South Sudan bring them food and evacuate the sick. The LRA have none of that. And the rainy season is beginning, it's only going to get worse: the mosquitos will multiply, and malaria with them, the grass will grow twice as tall as the men, the slightest track will be easily spotted, even that of a lone fugitive. As if on cue, thunder rumbles, drawing closer. Then comes the rain, light at first and then very quickly in a downpour, in a few instants you're completely soaked, head, legs, buttocks, the poncho helps a little but it keeps getting snagged, you move forward heavily, panting, head bent under the rain, finally you emerge into a dripping savannah, the rain stops suddenly, there are just a few dozen meters left, the camp is close, you can smell it, fire, sweat, beans, cut grass. One last sunray pierces through the trees, the sun keels toward the horizon. Those last 400 meters will have cost you an hour. UPDF squad marching through the bush. Northern DRC, May 2011. When you leave again, by helicopter, you won't look at the forest in the same manner. Those pale green, open patches, which look so easy to cross, are the swampy expanses stifled with tall grass. They are prolonged, through the greyish green of young trees, by broad swaths of dark trees, much taller, mango trees and other old growth, tracing the bed of a river that in the dry season doesn't exist. The vegetation grows, dies, collapses, gets tangled up, and you understand that this immense expanse is anything but a sea, it's neither flat nor undifferentiated but shot through with veins, with lines of force, with bends and irregularities that influence the passage and presence of humans, and condition the hunt for them. If the jungle is the universe of the trace par excellence, then the phantom war waged by the UPDF on the LRA is a kind of semiotic warfare. The two enemies never see each other, only when an LRA, exhausted, comes out to surrender, or during rare firefights, when the UPDF crash into them by surprise and kill them, capture them, or make them flee. In the classic model of the manhunt, as anyone who has seen The Most Dangerous Game knows, the time always comes when the prey turns against the hunter; but here, no chance for that, the disproportion of forces is overwhelming, the LRA are scattered in groups of 4 to 6 fighters, rarely more, not all of them have firearms and ammunition is scarce, 10, 8, maybe just 4 cartridges per gun, say 60 or 70 cartridges for the group, whereas a UPDF squad, with its 40 or 45 men and its PK machine guns, can count on a firepower of five to six thousand rounds. Thus each prowls around the other, searching out his traces. Everything here, since it's interpreted by men, is a sign. "After stealing food on the road," reflects Captain Patrick, trying to reconstitute the journey of those we're searching for, "they camped where we slept, then they brought their spoils to the main defense, for the commander." During the march, soldiers are detached to the flanks of the column to spot traces: crushed grass, a trampled pond, a cut vine that can be approximately dated by how dry it is. Little by little the whole itinerary is reconstituted, along with the enemy group's pattern of life. Three days before, Lieutenant Bosco Otim Omony, sent in search of an LRA group of ten to fifteen men active south of the Sudanese border, had located the rebels as they were cooking; but they heard him approaching, opened fire and fled. 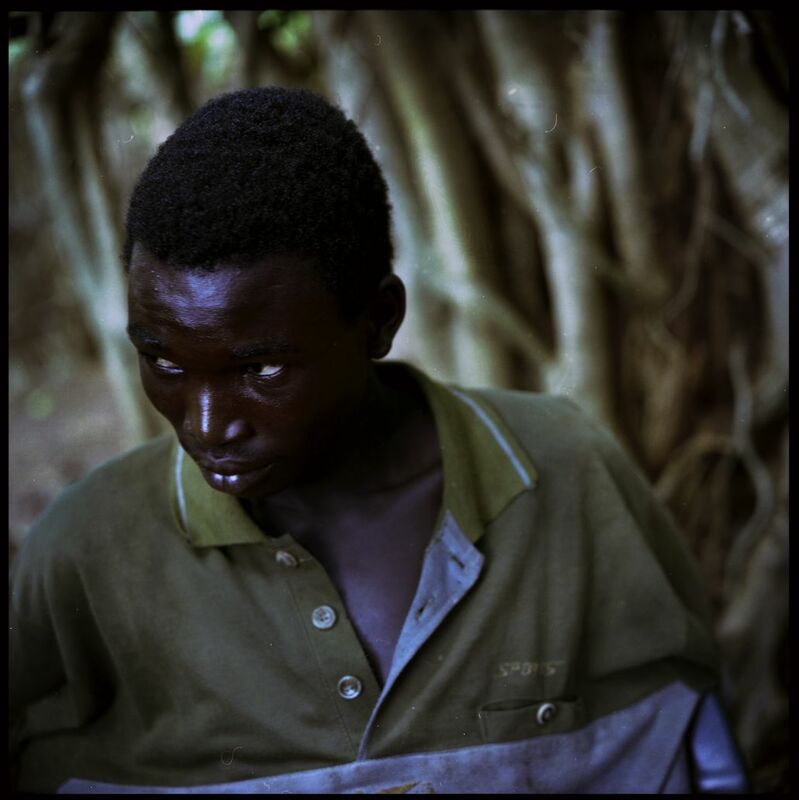 Bosco's squad chased them to the road leading to the border, then crossed it to search the bush on the other side for two days, in vain for the LRA, cunningly, had turned back. But one of their captives, a Sudanese man, had taken advantage of the confusion to escape and find a Congolese Army post. He led Bosco to the defense where we joined him with Patrick, whose reinforcement group would remain there in ambush, just in case, while the squad would continue its search. The next day, we find a third camp, set up in the ruins of Zande huts, near a watering hole; the following day, the soldiers set out to search for traces around the water, drawing a large circle around the camp to determine the direction the enemy took when they left. But the LRA do the same thing with the UPDF, they too look out for their traces, search through their abandoned camps, and sometimes even camp there, counting on the fact that the UPDF won't return anytime soon. Their sole advantage lies in their swiftness and mobility. "UPDF have no speed," Vincent Okema, a former LRA captain who defected to the UPDF in 2007, explained to me a few days later, 300 kilometers away, in the savannah of Pasi, south of the Central African border. "But LRA have speed, walking speed, if they know that UPDF is after them, they can walk the double. They can walk in one day or two days what UPDF walk in three or four days." If they sense they're being followed, they arrange a rendezvous at some landmark, a tall tree or a watering hole, then they separate, skirting around their pursuers' flanks one by one to meet up behind them. Sometimes they'll even put themselves in the tracks of the UPDF and follow them, knowing they won't turn back. But the UPDF also know this, and so sometimes they send a second squad behind the first one, five or eight kilometers apart, to catch the LRA in a pincer movement. It's a war of attrition. The ones the UPDF call "the original LRA," the Acholi fighters who followed their leader Joseph Kony west of the Nile towards the end of 2005, number less than two hundred, maybe only a hundred and fifty, and every month, two or four them are killed or surrender. Their Congolese or Sudanese captives don't count: even if the LRA give them a gun, they don't trust them; and ever since they were chased out of Uganda, driven hundreds of kilometers west, they can no longer kidnap Acholi children as they did earlier and, in the words of Vincent Okema, "politicize" them. Vincent was kidnapped in 1993, in Gulu, he was already twenty-two or twenty-three years old and was almost immediately killed, because his kidnappers thought he was already too old to be "politicized," even though he himself feels he wasn't mature at all, and explains how quickly he adopted the LRA ideology preached by Kony and his commanders. The LRA forms an almost perfect model of a closed group; it reproduces by predation, through capture, and is entirely self-contained. The group is structured by its rules, dictated by Kony on orders of the spirits that speak through him: even when you don't understand them, like Vincent Okema when he draws up a list of them for me, they must be obeyed. An LRA rebel doesn't drink or smoke, and eats no pork or lamb, animals full of sin. Women who have their periods can't cook. When he crosses water, the LRA does so in silence, and takes a little water in the palm of his hand, to trace a cross on his head. He doesn't make fire with stones, that's how you can recognize his campsite, from the little sticks planted around the fire to hold up the pots, unlike the UPDF who use stones or pieces of termite mounds. These are also forbidden; in combat, the LRA is not allowed to hide behind them, or to climb on top of them to observe or shoot. Before battle, he cannot sleep with his wife: "If you play 'shake' with her," says Vincent, "you will die there." If he sleeps with a woman who was not assigned to him by the commander, he will be killed, or will receive at least 300 lashes with a cane. The punishment depends on Kony's mood; but those who try to run away are killed, "no excuse," says Vincent, often by other captives, beaten to death with a stick. Many of them would like to surrender, of course, not just the recent captives, most of the historic LRA too, probably. But they're afraid, afraid of their comrades and their leaders, afraid too of what will happen to them outside of the group: afraid of being lynched by villagers if they give themselves up alone (and in the Congo that often happens), afraid of being tortured or killed by the Congolese or Ugandan military, afraid of the ICC, afraid of the Ugandan courts, afraid of revenge back in Acholi country. In fact the LRA who surrender are well-treated, they are interrogated but without violence, it isn't necessary, once out of the bush they have nothing to hide; then they're sent back to Uganda, where they're granted amnesty, go through a program of psycho-social reinsertion and sometimes get some professional training, before being sent back home with a little money and a few household supplies, or joining the army, more or less voluntarily. But how can all this be communicated to them? Once again, it's a semiotic problem. The United Nations, in Uganda first and then in the Congo, has launched radio broadcasts, where former LRA testify to their new lives: many destroyed radios soon began to turn up in LRA encampments. Fliers are also posted in the forest, written in at least five languages; letters are written inviting them to surrender, which are hung, rolled inside a little plastic bottle, near their camps. But the LRA leaders do counter-propaganda, and for fighters kidnapped young, indoctrinated to feel terror of the government and kept isolated all their lives, it is hard to believe the reassurances of the UPDF. "Even me," Vincent exclaims, "when I was in the bush, I don't realize, I don't think, 'Sure, if I come back to the government I will be safe like this.' But when I reach here, the way the government is taking me, is protecting me, I realized later, it is very very very good. But there is no way to go and preach to those people who have stayed in the bush. If I leave a letter, some others will say, 'No, this one is deceiving us.' But if there will be some communication that we can communicate with them, no one can remain in the bush." Richard Komakech, an LRA defector, at a UPDF base at Obo, Central African Republic (CAR), May 2011. By chance I came across one, an LRA fighter just out of the bush, the day I visited the UPDF base in Obo, in the Central African Republic. Richard Komakech, his name was, a twenty-four-year-old boy abducted at the age of 12 from his home district of Pader, in Acholiland. Along with three friends, one of whom had gotten into an argument with another LRA fighter over a woman, he had run away in late 2010, somewhere near Darfur, from one of the groups close to Kony. They had wandered for months, making their way south towards the Congolese border, and then one day, while searching for water, he lost his way and got separated from his friends; so he went and turned himself in to the local Gendarmerie, which handed him over to the UPDF, the following day at breakfast time. "Give that boy some food!," barked Lieutenant-Colonel Benedict Sserwada, the officer in charge; and, seated under the headquarter's top-secret map, the former LRA fighter wordlessly devoured his grilled chicken, nervously darting his narrow eyes about in disbelief and curiosity. "In the beginning, yes, I supported the LRA," he explains to me a little later somewhat shyly, averting his gaze, smiling as he answers my questions translated by a Ugandan intelligence officer. "The LRA convinced us that we would go home and take over the government and have jobs. But recently, I saw that nothing of this was happening. So this is why I decided to come out." His feet keep shuffling, he speaks in an almost childlike voice, and I've never seen anyone quite so lost. They must all be like that, almost, even possibly someone like Dominic Ongwen. Lieutenant David Agaba, who co-leads Vincent Okema's squad, was chasing one of Ongwen's groups last August, near Duru in northeastern Congo. "They had kidnapped a lot of people, in Duru, in Nakale, in Mogologo. Every five kilometers, I'd find a corpse." The smiling lieutenant mimes how they were found: arms tied behind their backs, at the elbows, skull smashed in with a stick. Survivors of the atrocious massacres in the Makombo region, in December 2009, recount how when the groups of killers joined up with Ongwen, in the bush, he had hymns sung to celebrate the killings. "He is a terrible person," the Acholi politician Betty Bigombe, who has led several unsuccessful negotiations with the LRA, told me last year in Kampala. "'Oh yes,' he said to me, 'we just kill for the sake of killing. It humiliates the government, that's good enough for us.'" Yet Vincent Okema does not hesitate to assert that Ongwen is innocent. "Dominic is a good person. If he had not been captured he will not be a bad person. The problem it is the one who has forced you, is the one who has captured you. Dominic was captured when he was young [at the age of nine], and he was forced to do all the thing. So the massacres he did, if he would have not been captured, how can he do those massacres? He cannot do it." In this logic, only the ones who chose violence, Kony first and foremost and his original commanders, the ones who elected to take up arms, are guilty of all this horror. "Kony is not a good person," Vincent also insists. But in the end, in this atrocious story, what is a good person? The UPDF certainly see themselves as the good guys—"I take pride in what we do," calmly explains Captain Patrick Mukundane, in the bush near Nakale. "I serve my country. I go home, I say I was in the jungle, in Congo, fighting the enemy"—and it's true that they carry out their mission, a most difficult one, with courage, determination, and a professionalism our own armies could envy. But that shouldn't make us forget the war crimes accumulated over almost two decades, during the fierce repression of the LRA in Acholiland, crimes that the ICC chose not to prosecute but that the locals have not forgotten, or else those committed in the Congo during the disastrous "Coltan wars" between 1998 and 2003. Which of course is why the UPDF are so readily willing to play the "embed" game, why they welcome Western journalists with real kindness: the propaganda value is obvious, there can be nothing but positive things to say about their operations, and that helps people to forget all the blunders, and also to ignore the recent and highly embarrassing fourth re-election of President Musevini, the former rebel who in his younger days used to argue that most of Africa's problems came from all those corrupt big men who cling to power for decades. It's like the discourse, systematically repeated by the Western media, that reduces the LRA to a group of religious fanatics and psychopaths, and which serves above all to sweep under the carpet that which Musevini has never been willing to admit, the fierce repression of the Acholis by his army and his long refusal to grant them the slightest political space. If there is a true enigma about the LRA, it doesn't lie in religious or mystical practices that are after all quite common in the region, but in the fact that a political uprising originally brought on, in 1986 and 1987, by genuine oppression (and thus serving objectives justified in the eyes of those who took up arms), so quickly mutated—by the end of the 1980s already—into a practice of radical violence, with no other aim, at the end, than its own perpetuation, beyond even the effective survival of the group. Is it possible for a social logic to get carried away by the momentum of its own velocity? To what extent did the very specific personality of Joseph Kony play a role? "Kony is a normal man," insist both Vincent Okema and Richard Komakech. But in 2008, peace was within reach, the agreements were on the table, accepted by the LRA negotiators and already signed by Kampala's envoys: yet Kony did not sign, thus bearing responsibility for Uganda's return to the military option, the extension of the conflict to three countries, and the nightmare of the region's population, which still continues. Vincent Okema, an LRA defector, and now a UPDF Captain, in the savanna of Pasi, Northern DRC, May 2011. The UPDF had transported us to the Pasi savannah to show us some LRA gardens, cultivated plots out in the middle of nowhere. They had found them a few weeks earlier, after a series of skirmishes in which they had killed an LRA commander, Captain Akema. The fields were rather scattered, with a good hour and a half walk between them. The rebels had harvested the sweet potatoes a month before, but there was still cassava, millet, sorghum; nakati, a vegetable; a plant called boo in Acholi, which the LRA make great use of as "war tea" when they are on the run; and unripe peanuts, which Ugandans call "g-nuts" or "ground nuts," planted scarcely three weeks earlier. The fields were obviously the product of great effort, you could still see the mounds of burnt trees, cut down and dragged aside before being piled up, the most recent one alone must have cost them a month of labor, now lost once and for all since even if the UPDF didn't destroy all the crops, it would just be to entice the LRA to return and fall into an ambush. The commanding officer of the squad here, Captain Moses Tumusiime, insists on this: "When you want to beat the enemy, you have to give him psychological torture." Vincent Okema, who would join us on foot two days later, thinks the same: "If the conditions is not yet [too bad], if they say, 'We have food, we have a good life,' he [the LRA] will not go back. That is why we put them in hard: they will see they have nowhere to go, no food, no what; then he must report to the government." Hidden in thick undergrowth, just above the gardens, is an LRA camp, the most elaborate I've seen, with huts made from branches and woven straw, half-burned by the UPDF. "I think if they were not hit here," ventures Captain Moses, "they were going to establish a permanent camp, maybe even for Kony himself." The place is dark, incredibly desolate. There are a lot of beds, and four large huts for the leaders, with vine ropes stretched above the roofs to hang ponchos from. Fragments of UPDF propaganda posters, showing former LRA members smiling with their families, still cling to the trees. On the ground, among the dead leaves, we find strips of colored cloth, which must have belonged to the kidnapped girls, a woven straw head cushion for carrying things, a plastic flip-flop, a hole-filled tarp. "They were still cultivating," Moses notes, showing us piles of cassava roots ready to be planted. In the very back, under the trees, runs a kind of little path, entirely covered in peanut shells. You don't need much effort to see the kidnapped children lined up there in the half-light, crouching silently from morning to night shelling the harvest, slaves of masters as desperate as they. Jonathan Littell was born in New York City in 1967. His novel Les Bienveillantes (The Kindly Ones) was published in French in 2006. He lives in Barcelona, Spain. Charlotte Mandell is a literary translator who has translated over thirty books, including works by Proust, Flaubert, Genet, Jean-Luc Nancy, Mathias Énard, and Jonathan Littell. She lives in the Hudson Valley with her husband, the poet Robert Kelly. Bénédicte Kurzen (France, 1980) is a documentary photographer focusing on conflict and socioeconomic changes in the African continent. Her work has appeared in numerous publications including The New Yorker, Harper's Magazine, Time, The New York Times, Newsweek, Paris Match, and Stern. Since 2010, she has been focusing on Nigeria, where she moved recently. She joined the NOOR photo agency in 2013. Photographs courtesy of Benedicte Kurzen/Noor.